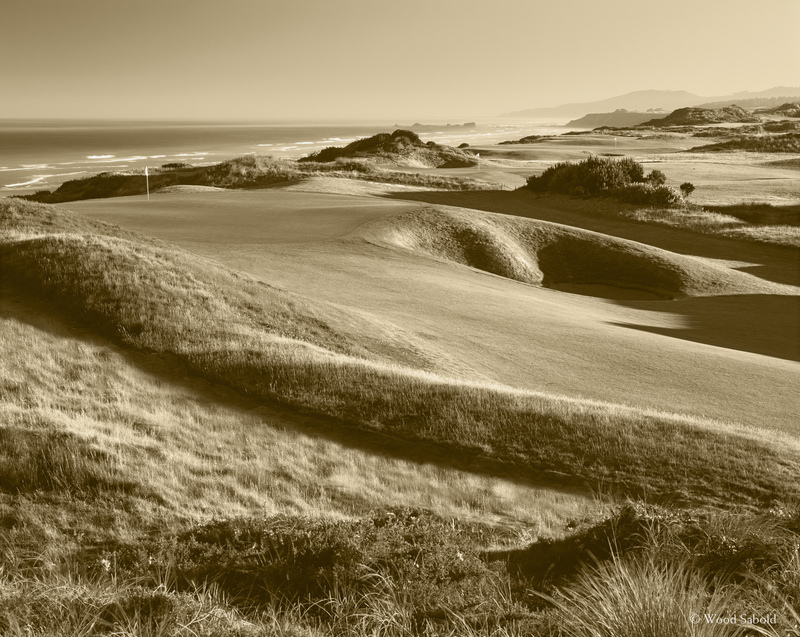 This is a sepia toned version of a view of Bandon Dunes Holes 15,12,4 and 5 lined up along the Pacific Ocean gorse cliffs on the Bandon Dunes Course of the Bandon Dunes Golf Resort. This is a dangerous par 3 with a very deep bunker that will swallow up any shots just a little short and to the right front of the green. Bandon Dunes hole 6, Pacific Dunes and Old Macdonald golf courses lie to the north along the coast and Cape Arago part of Shore Acres State Park on the southern coast of Oregon are in the far distance. Architect, David McLay Kidd, DMK Design.